Detective and concealed cameras are fascinating pieces of photographic apparatus that were important in recording "snaphot" images of daily late-Victorian life. Snapshot photography quickly evolved when the first instantaneous hand cameras were introduced. 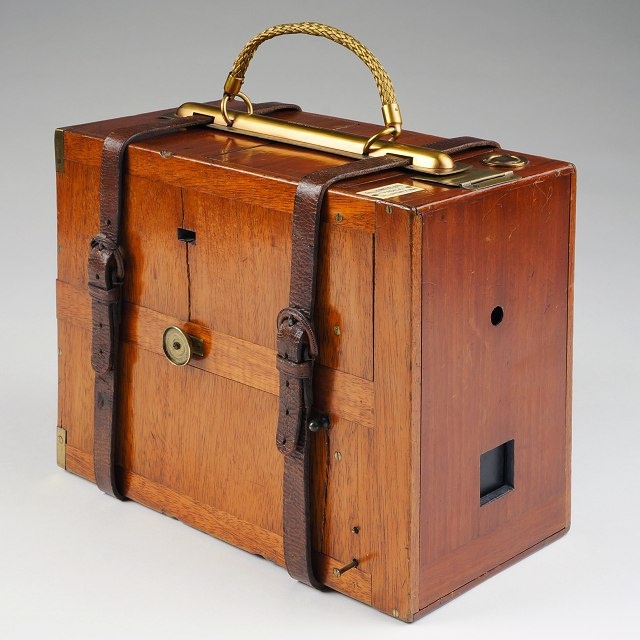 The earliest hand-held apparatus was simply a bellows camera placed inside a carrying case. Later forms evolved into "detective" and "concealed" cameras to unobtrusively photograph subjects. It was Thomas Bolas who first suggested the "detective" camera concept in 1881. Detective cameras, basically a box with a hole for the lens in front, proved to be quite popular yet awkward to operate. Although a detective could be used in the "hand" or removed from the box for use on a "stand," the process of picture taking was quite involved - having to compose and focus on a ground glass, set the shutter, and manipulate plateholders and darkslides. However manufacturers persisted in creating a self-contained "detective" which could be easily used in the field without having to open the camera to change plates. But it wasn't until the mid-1880s that an amateur photographer, R. Offord, suggested the idea for a self-contained detective camera. 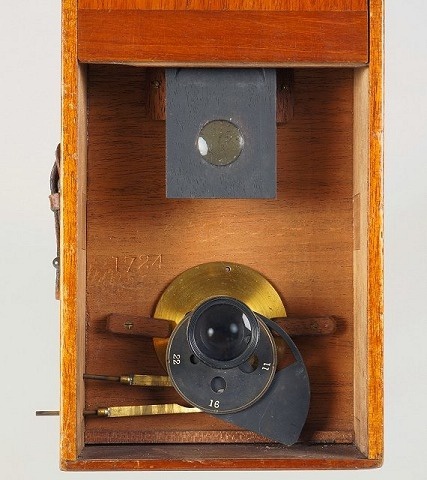 Frank Miall, who made cameras and dry plates for the photographic supplier Jonathan Fallowfield, put Offord's design into use and introduced a self-contained detective. It was later named the Facile when Fallowfield's introduced it in 1887 or 1888. The design was important because it was one of the earliest detective style cameras to feature an internal plate changing mechanism, which allowed photographers to avoid the complicated process of opening the camera to change plates for the next picture; a highly desirable feature. The Facile was intentionally designed in the guise of an unassuming box or concealed as a wrapped parcel complete with leather straps and handle. Realizing its potential for candid photography, the English photographer Paul Martin used a Facile concealed in a wrapping of brown paper to photograph London people at work and play in the 1890s. As shown in the Facile Advertisement, Paul Martin would have casually strolled the streets of London with the camera tucked under his right arm as if carrying a package. Without a brown paper wrap, and with the lens hidden behind a metal sheath of blackened tin, the Facile appears to be a polished wood parcel. With his hand draped over the side of the camera, thumb and fingers resting comfortably near two shutter buttons and a casual glance at the viewfinder, he could quickly line up an image and trip the shutter with almost no detection. A simple clockwise turn of the milled brass knob on the side of the camera and the itinerant photographer was prepared for the next picture. On one particular outing, a heavy rainstorm proved disastrous (probably quite messy as the paper casing disintegrated) and a replacement case of black leather was commissioned for the camera. Paul Martin's Facile and original leather case currently reside in the Royal Photographic Society's extensive camera collection. The Facile is a scarce to rare ¼-plate, fixed focus camera. The earliest models were constructed of polished mahogany or covered in morroco leather while later versions were made with a black painted wood finish. It was rather bulky measuring 11" x 5-1/2" x 8-/12" high and weighed 6 lbs. when fully loaded with twelve metal sheathed plates. Plates were changed inside the camera by turning a milled brass knob. A double rack and pinion moved a pair of boxes in opposite directions. An upper box loaded with unexposed plates moved forward and would drop the next plate into a lower box (which moves backwards) when a pair of slots aligned. Although plate changing finally became convenient, the camera still had to be loaded and unloaded in a darkroom if more than twelve pictures were desired. At least three versions of the Facile were made. The cheapest version had a fixed aperture while a more expensive model came with an f/8 rapid rectilinear lens and wheel stops. A Focusing Facile was later introduced in 1897. During this time, both the original and focusing models were advertised with several different cases: brown waterproof paper, rigid mail-cloth, or leather with a shoulder strap. To help keep the concealing aspects of the camera intact, a blackened tin cover would slide down in front of the lens when the waist-level viewfinder cover was lowered. This particular Facile is an early (expensive) mahogany version with the rapid rectilinear lens and wheel stops, rarely seen original leather straps, and distinctive woven brass carrying handle. It is dated c1890 because the Fallowfield maker's label has the 146 Charing Cross Road, London address. 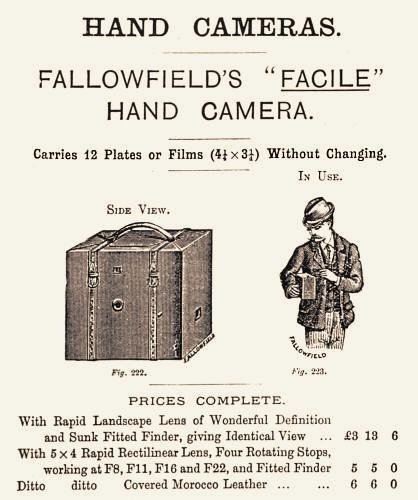 Established in 1856, Fallowfield was a very active retailer of cameras and supplies. Raising the front panel reveals the brass barreled f/8 rapid rectilinear lens. The rotating wheel stop has four settings from f/8 to f/22. Fallowfield advertising also notes f/11 as the "most useful stop," which likely makes sense because the photographer would not want to expose the camera's concealment to change settings. The lens assembly is held in place with a pair of pivoting mahogany wood strips. The simple sector shutter is activated by pushing one of two metal pins. In the image, the lower pin is extended and ready to trip the shutter. Shutter speeds varied depending on how fast the pins were depressed. Fallowfield advertised that speeds up to 1/50th of a second could be attained. Front panel raised showing the lens and simple shutter.